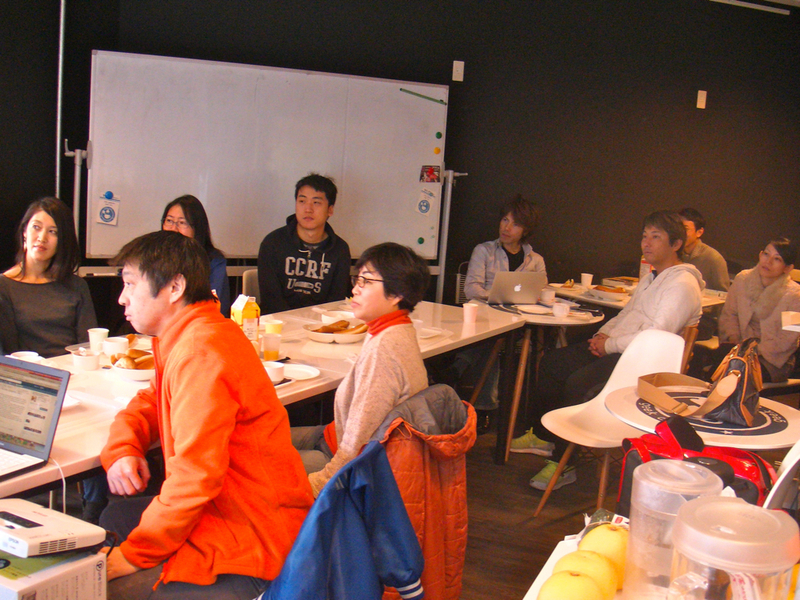 We have been organizing asakatsu (literally “morning activities”) meetups since early 2013. Initially, we focused on bringing people together for discussions on hot topics in English with English learners and native English speakers. From these meetings, we had the idea to start a new project. Because My Eyes Tokyo does regular interviews with both local and international artists and business, we thought it would be interesting to do bring these interviewees to asakatsu and conduct the interview openly in English with meetup participants. We have titled this project “MET Morning Interview.” Our first guest is Loren Fykes, an American entrepreneur who has launched a shop and restaurant recommendation app called “Quchy” in Japan. When you find a restaurant you like or want to remember the restaurants you love, get the card on Quchy! One day last summer, Tokuhashi, founder of My Eyes Tokyo, came across a post on Facebook News Feed. It was a “Help Wanted” post by Mr. Fykes. Tokuhashi was interested in helping the startup because he was also planning to launch a service of his own sometime soon. Also, he was interested in an American guy who decided to start his own business here in Japan. The two met at Mr. Fykes’ office in Tokyo about a week later. Mr. Fykes made a hearty blueberry smoothie (It was really good! ), and the two talked a lot about their ideas and passions with each other in Japanese. Tokuhashi was moved by Fykes’ passion for Quchy, so when MET came up with an idea of an open public interview a few months later, Tokuhashi suggested Fykes as the first guest speaker. 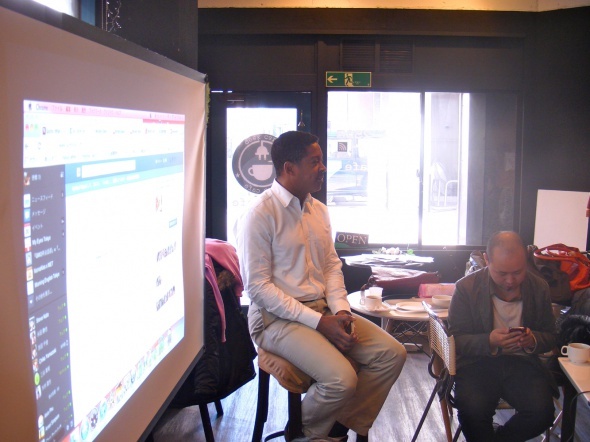 Mr. Fykes talked about his history, career and even his philosophy of life thoroughly in front of the audience, many of whom are eager to improve their English and start a business themselves. Enjoy! Every time I go to a new place, I always ask my friends, “Where should I go for coffee?” “Where should I go for breakfast?” And they typically give me a list of five places written down on a piece of paper. They have to do that every time! So I thought this is a kind of problem. It should be easier. You shouldn’t have to write it down. Save these five places, and every time someone asks you, say check out my list on Quchy. What I wanted to do with Quchy is to give users the ability to save right now, anywhere, all of your favorite restaurants on it. You can do the same thing in London. If you don’t want to walk around with a Japanese travel magazine about London because it’s too big, you can use Quchy and put the name of the favorite restaurants in London on it and save them. Then, when you walk around in London, you have all the restaurants that you wanted to see “in your pocket” saved on your iPhone. So you can use Quchy for traveling to save spots that you want to see later. You can also make recommendation lists to share with your friends who come to Tokyo. You can also ask your friends to create lists for you if you are about to go to a place you’re not familiar with. You can view their favorite places. It’s an easy way of creating lists of restaurants and spots that you enjoyed. We’ll focus on showing you the shops and restaurants that are recommended by a certain lifestyle. I want to have a service like, “I need to go to a place where there’s a good dish to prevent diabetes on the menu.” I want to show places based on lifestyles. If you care about interior design of restaurants, you can see lists that are created by other designers, architects or photographers. I’m from Flint, Michigan. It’s a small town, but actually very, very famous in the US because Flint was the center of the car industry. I went to a public school, private high school and then entered Harvard University. I decided to study literature and semiotics, the philosophy of meaning in language. After I was graduated from Harvard, I received a fellowship to study at University of Tokyo. So, I came to Japan on October 8, 1993. I studied comparative literature at University of Tokyo, and then while I was doing this, I realized that an academic profession was very isolating and required a lot of discipline for research. So I decided that I was not suited for academia. I dropped out of the PhD program and decided to pursue career in either banking or consulting. I took a job at a company called Jardine Fleming, now it’s JP Morgan Chase, the investment bank based in Hong Kong. I worked in equity research and initially I was given the sector of steels and precious metals. As you know my background is literature, so when I was assigned to steels and precious metals, I was a little disappointed. So I told my boss and he gave me a job covering gaming companies and telecommunication companies. I helped with research on NTT (Nippon Telegraph & Telephone Corporation) when NTT first went public back in 1997 or 1998. At that time, telecommunication companies were becoming data companies thanks to ADSL etc. And many things were happening to “content” on the Internet. So I knew that I wanted to do something related to content. I was transferred to New York. After working with the Rockefeller family‘s trust for a year, I decided to talk to television companies. I called every television company and I got a job at Nickelodeon which is owned by MTV Networks, and because I had experience in Asia and I spoke Japanese very well back then, I was sent to Asia. I worked in Singapore for MTV Networks for 2 years. Then 911 happened. All the media companies and airline companies laid off many people. I didn’t lose my job but they laid off many senior executives. So I decided to go to Australia because I knew that my contract was going to end. I went to Sydney for a small vacation to think about what was going to happen in the world. I stayed there for 3 years! I got a job at FOX Kids after a year of coming to Australia. I was a General Manager for FOX Kids in Australia and New Zealand. I did it for a short time and enrolled in a business school. After that, Turner approached me and asked me to do corporate development and business development and strategy for Asia in Hong Kong. So I took the job and moved to Hong Kong. I was in Hong Kong for 4 years. Then I moved back to Japan and I took a job at a company called Oak Lawn Marketing in Nagoya. It’s famous for “Billy’s Boot Camp”. I learned “direct marketing” there. The company was established by Robert W. Roche and Nakamura-san in 1991 and they sold the company to NTT Docomo for US$600 million in 2009. They made a lot of money obviously. I was very impressed by their entrepreneurship. Here was an example of two men who started a company in Japan, one was American and one was Japanese, they partnered together. They made a company out of zero and it was sold to a big company for a lot of money. So I felt that it was possible to do anything, anywhere if you have persistence, drive, passion, vision and a good team. So I quit Oak Lawn and joined a small company. They launched the first Groupon-type company in Japan called “Piku”. I helped to launch Piku in Japan in April 2010 and we were the #1 flash marketing company until December 2010. But Groupon and other flash marketing companies became bigger. In the end, we lost the discount deal competition and then “311”, Great East Japan Earthquake, happened in March 2011. People were not buying things online anymore. Everything slowed down. But I had gained experience in a startup. 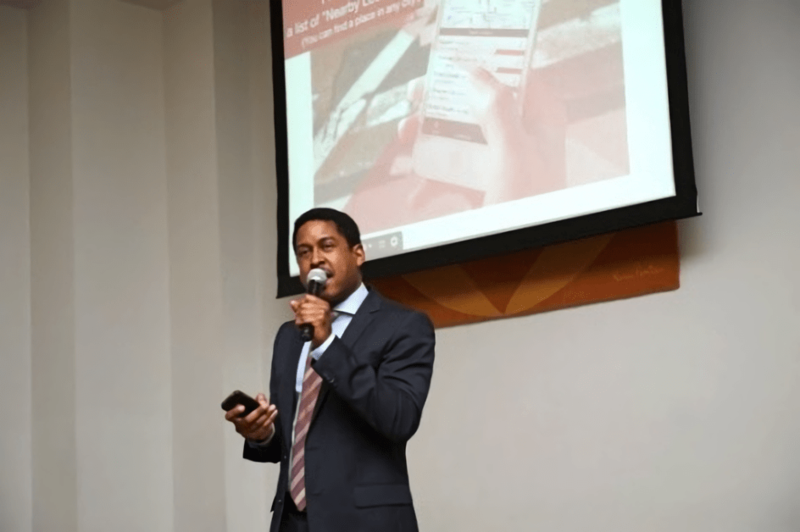 We received 8 million dollars when we launched Piku. When I joined the company, we had only 6 or 7 people. But there were 130 people six months later. It was very fast growth. That experience told me that running a company is not easy but you can try. I received confidence to start my own business from that experience. I quit Piku in May 2011, and I started my own company “Endymion”, which is the parent company of the service “Quchy.” At that time, all I had was an idea. I didn’t have a technical co-founder, I didn’t have a business plan or strategy. So I started networking in Japan and started going to meetups. 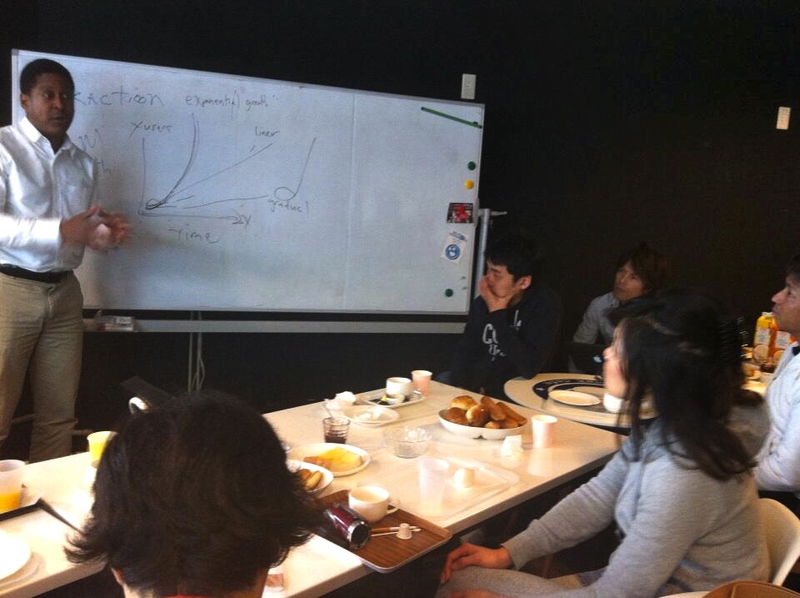 I researched incubators and accelerators in Japan. Eventually I found someone who wanted to do business together. His name is Scott. He and I organized a team in April 2012 and we began to build the service. 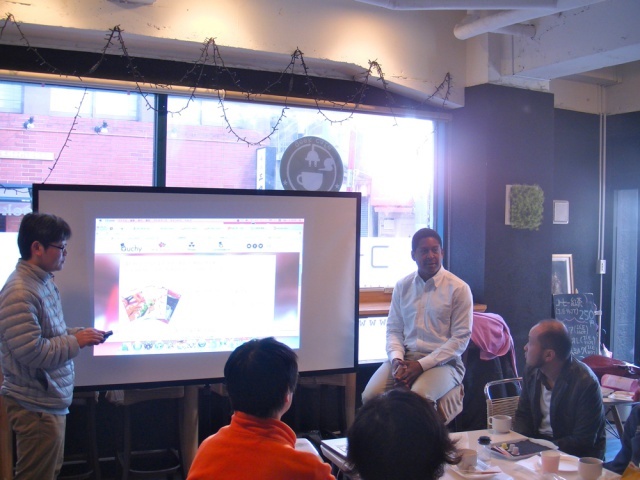 Before that, I received investment from Kentaro Sakakibara, a Japanese incubator (Samurai Incubate). I used his investment, four million yen, and I outsourced my development because this is before I met Scott. I outsourced to Yamaguchi-san and Murata-san. 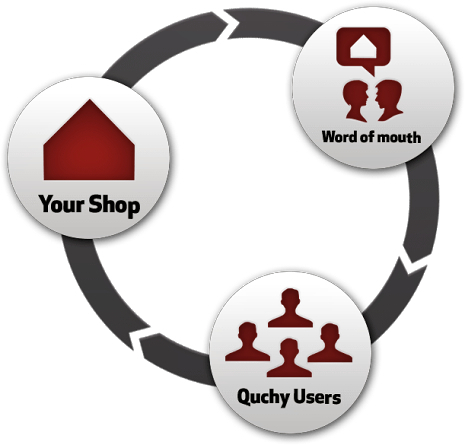 They helped me to make my first prototype of Quchy. Then I went around and received 20 million yen from an angel. Then we developed what you see today. Didn’t you feel afraid for setting up your own business? People like me, a hired salaryman, tend to be very afraid of making a step forward in that way. Of course there’s no guarantee for a salaryman either, but for me, it sounds risky, but on the other hand, I envy and respect those who took action. I have been thinking about Quchy or something like this for a long time — since maybe 2005 or 2004. I had this idea. So if I had been more confident and courageous, I could’ve started the business then. But I didn’t because I was afraid. But time passed. We all have our own fears and anxieties. But you have to believe that you can always try again even if you do not succeed. It’s not money that you need. You need family and support and people like you that you say you want to hear my story. You need community and you need help, and you need your own belief in yourself. When you believe in yourself and what you want to do, people come to help you. So believe in yourself and have the courage to believe in yourself. Even if it doesn’t work out, two years later or three years later you can make a second choice. The world doesn’t end. And nothing happens overnight. Most people work hard everyday and build something slowly overtime. So my advice is; Start thinking about what you want to do! I think fear comes from lack of knowledge. When you don’t know about something, you feel fear about it. But if you research, network and find more information, your fear will lessen. 1. You can’t control what happens around you. But you can control how you react to it. 2. If you’re thinking all the time, you’ll get depressed. In order not to do that, control your body and health. Stop thinking, do! Those three things keep you positive! My ultimate goal is… In terms of Quchy, my goal is, Quchy lets you make your own map. You save the places on Quchy, which means you’re creating your own map of Tokyo, you’re creating your own map of London, and you’re creating your own map of Nagoya. And you can share these maps. I want to make the map more fun. For example, I want to see that my friend has some favorite restaurants around Suidobashi and when I come to the station and look up the way to Geek Cafe (venue of this event) — I already have Geek Cafe on Quchy — so I can also see “Oh, she likes these 3 places (near Geek Cafe)! Oh, I will go to this place for lunch later!” Something like this. I know that if she likes the place, maybe it’s a good recommendation. So I can know that when I come here. Also I’m trying to make it easier to find places that match your lifestyle. That’s my goal with the service. I want to transform the way we think about the locations and make locations about lifestyle and making it easy to share locations by lifestyle and by curation. Just be yourself, Tokyo & Japan! 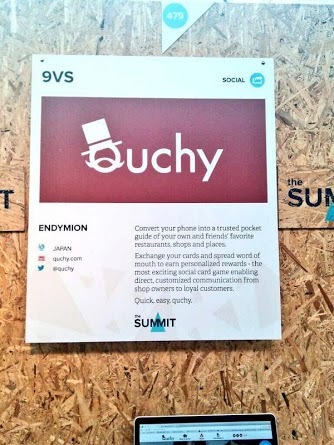 Quchy was selected as an Alpha Startup by Web Summit Dublin (Europe’s largest tech conference) because they thought that we are innovative and doing a big thing. So we went to Dublin, Ireland, for a week. Then I flew to London to join a board meeting and talk to many of my friends. I love London. It’s like a lot of villages, it’s very diverse. There are a lot of people from all over the world. All are speaking their native languages. In London, you can be anybody from anywhere. You can be yourself. London is more international than New York, because London has all of Europe, Middle East and Africa. So there are Persians, people from Abu Dhabi, Moroccans, Nigerians, Belarusians, Estonians, Swedish, Polish. There are always Halal restaurants, Persian shops and people are smoking hookah. People are being themselves, preserving their own cultures. On the other hand, New York is also very diverse. But everyone in New York wants to be a New Yorker. No one wants to be who they are. They want to say, “I’m a New Yorker”. So there is a passion to put being a New Yorker over your own cultural identity. Even though New Yorkers are very diverse, everyone is trying to be a New Yorker. And no one in New York says, “Why did you come to New York?” Who says that? If I’m asked, “Why did you come to Tokyo?” by Japanese people… Come on! Think! Your city is amazing and Japanese culture is respected around the world. My first time having sushi was 1983 or 1984 at “Benihana” in Boston. I felt, “Oh my God, it’s so delicious!” No one had ever had sushi before at that time. My point is that Japan’s influence culturally is felt throughout the world. Food, film, aesthetics, design, electronics, technology… So you don’t need to be like anybody else. You don’t need to be like New York or London. You can be yourself. And be super proud of it! Be proud of Japanese language; be proud of Japanese aesthetics and culture. And don’t ask questions like “Why are you in Tokyo?” To me, it’s obvious. Tokyo is amazing. Tokyo is incredible. It’s huge. There are beautiful restaurants all over the place. I see Tokyo as a place where there’s a lot of money and a lot of ideas. Also it’s always changing. New shops and things are happening. People are following their passions. You can go to the neighborhood and also find new little stores and things. It’s always changing. You can’t keep up. Too much happening, always happening. I love that. So what is Tokyo to me? Quchy in iTunes: Click HERE!